Borne from the collaboration between English composer Benjamin Britten and Soviet cellist Mstislav Rostropovich, the three Britten Cello Suites stand as a towering megalith in the solo cello literature. Written between 1964-71, the Suites are among the most conceptually varied and technically demanding works written in the 20th century; and, in their extreme use of extended techniques, have come to redefine the cello’s potential as a solo instrument. Moments of ineffable poignancy, subtle humor, breathtaking showmanship, and an almost vocal lyricism define their performance. 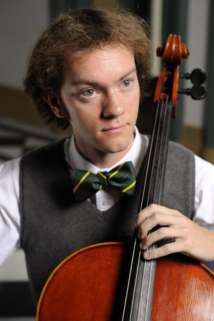 Rarely heard in their entirety, Gallery 263 hosts Boston-based cellist Ben Swartz for the complete Britten Suites – one night only! Paying homage to a half-century since their initial conception, cellist Ben Swartz breathes new life and a uniquely virtuosic spirit into the Suites. A graduate of the Royal Academy of Music in London, Ben recently returned to the USA after several years in Europe, where he studied the Britten Suites on a Woodrow Wilson Fellowship with famed Dutch master and noted Britten interpreter, Pieter Wispelwey. Concert begins at 8:00pm, and each suite is approximately 25 minutes in duration. Doors open at 7:30pm.